Miss Angola participating in the national vaccination campaign. Photo courtesy Africare/CORE Group. Despite eradication efforts, the debilitating polio virus continues to infect thousands of individuals every year. Although India, Pakistan, and Afghanistan have witnessed the largest resurgence of recent cases, Africa has also seen the continuing persistence of the virus, particularly in Angola. Almost declared polio-free in the early 2000’s, Angola has unfortunately seen an increase in the number of reported cases over the past few years. The present polio outbreak in Angola is a serious risk to the neighbouring countries and also an acute challenge to the global polio eradication effort with the World Health Organization classifying the outbreak as an emergency. On Thursday, March 24th, the Angola Field Group invites you to a presentation given by Africare’s Country Director, Christian Isely, and Africare’s Program Director, Dr. Peter Wirsiy. With over forty years of experience implementing development and humanitarian projects in over thirty five African countries and over twenty years of experience working in Angola, Africare (www.africare.org) is currently playing a lead role in combating the spread of polio in the provinces of Luanda, Zaire, and Kwanza Sul. In coordination with USAID, the Gates Foundation, UNICEF, the CORE Group, the Salvation Army, Catholic Relief Services, Save the Children, and World Vision, Africare is ramping up efforts to increase vaccine coverage. Come learn about this dreadful disease, the epidemic in Angola, and the current drive to finally eliminate it from the country. 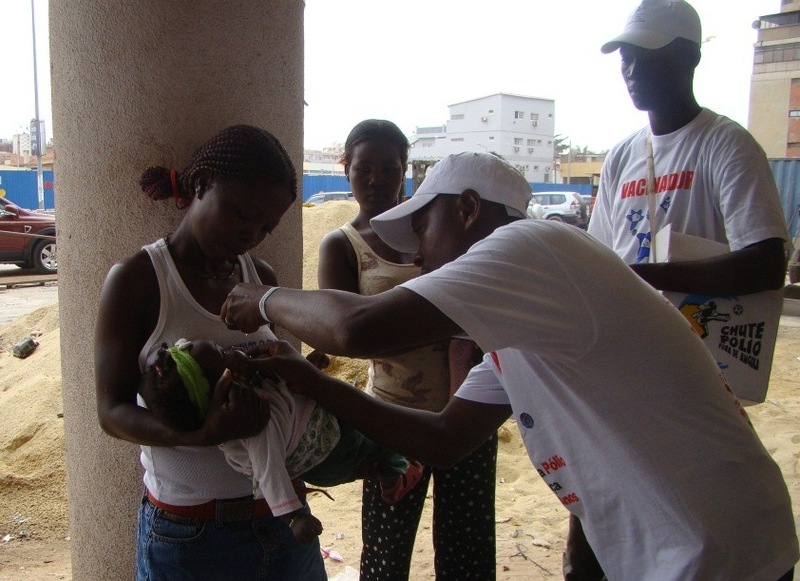 Community volunteers vaccinating a child. Photo courtesy Africare/CORE Group.